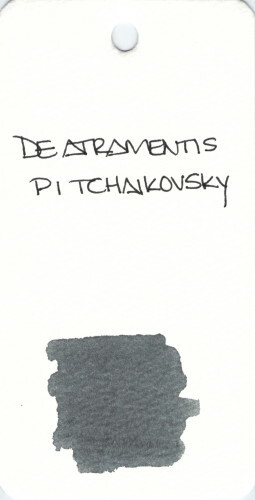 I’m guessing that ole Tchaikovsky here is a twin for another De Atramentis gray ink, but I don’t know which one. I have a fantasy that one day I will sit down and figure all of them out – in my copious amounts of (nonexistent) spare time. This entry was posted in INKS and tagged de atramentis, fifty shades of grey, gray, grey, ink swab by Christine (Pentulant). Bookmark the permalink.